Alan Patera started out as a stamp collector. When he was a graduate student in Geography at Berkeley in the 1960s, he started to collect postmarks by driving around California mailing envelopes to himself. He and a friend competed to see who could collect the most California postmarks, including walking 20 miles to get one that could not be reached by road. When he completed his education, he moved to a job at the US Census Bureau in Washington D.C. where he continued to collect postmarks and also began to do original research on postal history at the National Archives. Over the years, he began publishing books listing all of the post offices that had ever operated in specific states. These books are valuable guides to people collecting postmarks and post cards as well as for historians looking for geographic names. In 1985 Alan moved to Portland Oregon with his wife Marge and two young children Robert and Liz. Alan started his own business to research, write, and publish books on western history. 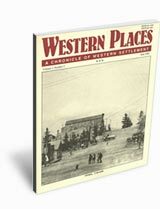 For 17 years he also served as editor and publisher for Western Express, the premier organization for collectors of western history. For the last 20 years he has also edited The Oregon Country, a publication of the Pacific Northwest Postal History Society. Over the years Alan has written over 50 publications himself and has edited and published books on western history written by other authors. Most of these books can be purchased on this website. All books are well-researched from original sources, packed with information, and easy to read. Alan continues his research, writing, and publishing business. He has an extensive personal collection of postmarks, post cards, and other western history paper memorabilia such as mining certificates and vintage photos. Soon he will launch a new website to sell duplicates from his collection. His wife Marge retired from Kaiser Permanente in 2009 and joined Western Places focusing on sales and marketing. They still enjoy adventurous road trips to ghost towns throughout the west. Check out our latest selection of books!